Well-intentioned regulations can have harmful unintended consequences. The 2007–2009 financial crisis revealed such a possibility for a particular regulation: the so-called Recourse Rule. After that rule reduced bank capital requirements for a narrow class of financial products, including those at the heart of the crisis, some bank holding companies (BHCs)—the legal structure within which many banks operate—increased their holdings of those financial products. The result was damaging to the BHCs that exposed themselves. Securitization involves pooling assets and selling bonds that redistribute the payment streams from those underlying assets to investors. Assets used in securitization deals include mortgages, home equity loans, or in the case of collateralized debt obligations (CDOs)—which featured prominently during the 2007–2009 crisis—other securitized assets. Bonds from securitization deals are typically called “tranches” when they reflect “slices” of the payment streams with different levels of seniority. Those tranches that pay holders from the payment streams generated by the underlying assets in the collateral pool earlier are deemed safer than those that pay later. In the context of securitization deals, “recourse” refers to the practice by BHCs of retaining some of the credit risk of the assets being securitized. Retaining some of the risk may serve as a signal of the quality of the underlying product. Traditionally, originating banks would hold the riskiest equity tranche. However, as I’ll explain, the Recourse Rule made holding the highest-rated tranches attractive. Banks, familiar with how securitization tranches are made, may also hold other banks’ securitization tranches. As with other assets, banks are required to back these bonds with capital. The aim of the Recourse Rule, finalized on November 29, 2001, by the Federal Reserve (Fed), the Federal Deposit Insurance Corporation (FDIC), and the Office of the Comptroller of the Currency (OCC), was to encourage securitization but not risk-taking. Before the Recourse Rule took effect, if a bank held tranches with a AAA, AA, or A rating, it had to have at least 4 percent, and sometimes 8 percent capital, to back the holdings. After the rule change, capital requirements for AAA- and AA-rated tranches fell to 1.6 percent, while the requirement for A-rated tranches was 4 percent. Lower risk weights allow BHCs to operate with less capital than they would have had if the capital ratios had been measured relative to total assets. After the Recourse Rule’s lower capital requirements took effect, BHCs that were in the business of securitizing assets began holding more of these assets and less of the lower-rated assets. On average, the larger the securitizing bank, the more of its portfolio was allocated to these bonds. It turns out that larger securitizing BHCs also tended to have subsidiaries that commented on the Recourse Rule–related notices of proposed rulemaking during the 1997 and 2000 notice-and-comment periods. Figure 1 depicts the ratio of estimated highly rated tranche holdings relative to total assets. The thin black vertical line distinguishes between the pre­­­­– and post–Recourse Rule periods. The other lines in the figure depict the average holdings for (1) BHCs that had no subsidiaries that commented on the proposed regulation during the notice-and-comment period, (2) BHCs that had subsidiaries that commented on the proposed regulation during the notice-and-comment period, (3) so-called Systemically Important Financial Institutions (SIFIs) with at least $50 billion in total assets that were engaged in securitizing assets, and (4) Global Systemically Important Banks (GSIBs), all of which engaged in securitizing assets and all of which had subsidiaries that commented on the proposed regulation during the notice-and-comment period. 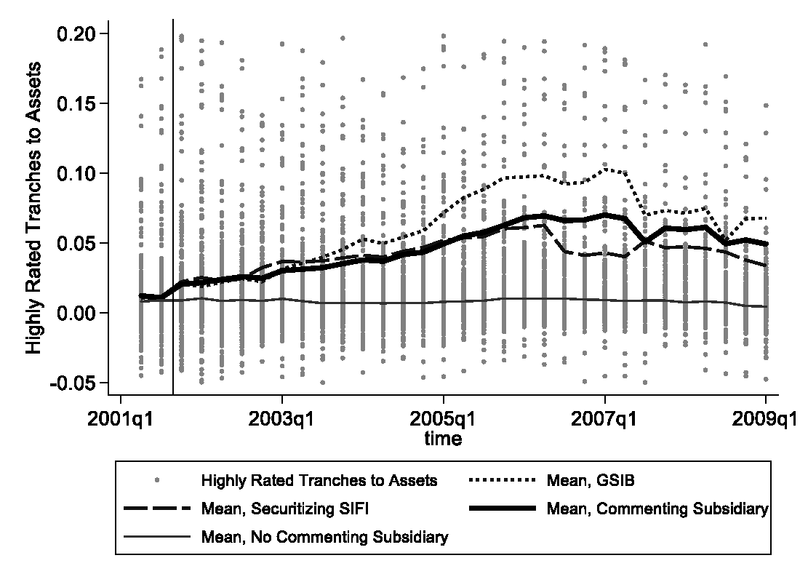 The basic lesson to draw from figure 1 is that BHCs with no commenting subsidiaries on average held the least and did not change their holdings after the rule change, while BHCs with commenting subsidiaries increased their holdings after the rule change until the crisis. Moreover, holdings for BHCs with commenting subsidiaries on average behaved much like average holdings for the larger securitizing BHCs. Lastly, the GSIBs on average held the biggest fraction of highly rated tranche holdings. 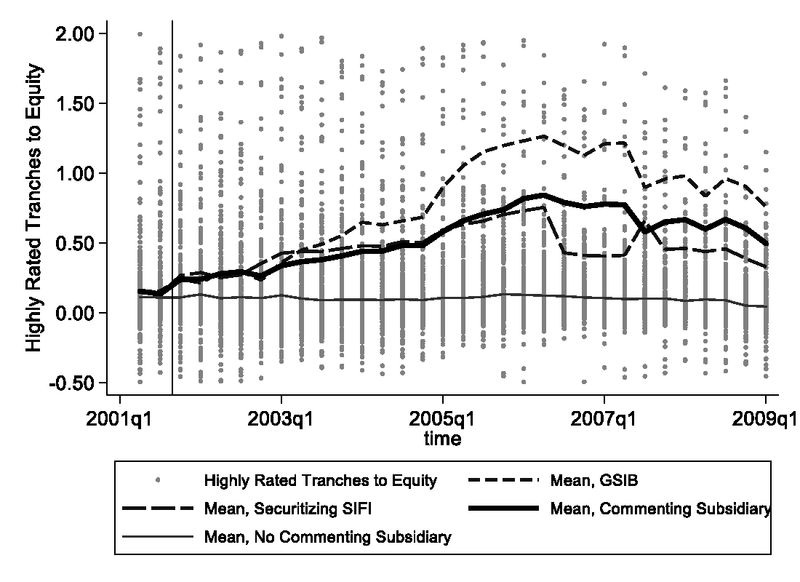 Note: For a discussion of the construction of the highly rated tranche variable see Isil Erel, Taylor Nadauld, and René M. Stulz, “Why Did Holdings of Highly Rated Securitization Tranches Differ So Much across Banks?,” Review of Financial Studies 27, no. 2 (2014): 404–53. Erel, Nadauld, and Stulz suggest estimating highly rated tranche holdings by adding held-to-maturity securities in the 20 percent and 50 percent risk buckets (bhc21754 and bhc51754), available-for-sale securities in the 20 percent and 50 percent risk buckets (bhc21773 and bhc51773), and trading assets–all other mortgage-backed securities (bhck3536). From this total, they subtract the amortized cost of held-to-maturity US government agency and corporation obligations issued by US government-sponsored agencies (bhck1294), the amortized cost of available-for-sale US government agency and corporation obligations issued by US government- sponsored agencies (bhck1297), the amortized cost of held-to-maturity mortgage pass-through securities issued by Fannie Mae and Freddie Mac (bhck1703), the amortized cost of available-for-sale mortgage pass-through securities issued by Fannie Mae and Freddie Mac (bhck1706), the amortized cost of held-to-maturity mortgage-backed securities issued or guaranteed by Fannie Mae, Freddie Mac, or Ginnie Mae (bhck1714), the amortized cost of available-for-sale mortgage-backed securities issued or guaranteed by Fannie Mae, Freddie Mac, or Ginnie Mae (bhck1716), the amortized cost of other held-to-maturity mortgage-backed securities collateralized by MBS issued or guaranteed by Fannie Mae, Freddie Mac, or Ginnie Mae (bhck1718), the amortized cost of other available-for-sale mortgage-backed securities collateralized by MBS issued or guaranteed by Fannie Mae, Freddie Mac, or Ginnie Mae (bhck1731), the amortized cost of held-to-maturity securities issued by states and political subdivisions in the United States (bhck8496), the amortized cost of available-for-sale securities issued by states and political subdivisions in the United States (bhck8498). This measure is divided by total assets (bhck2170). Estimates range from −0.19 to 0.36, though I limit the range depicted in the graph to being between −0.05 and 0.2 to better visualize the BHC group averages. Source: The data for all reporting BHCs with greater than $1 billion are recorded in the Chicago Fed Call Report Y-9C forms, available from The Wharton School, University of Pennsylvania, “Wharton Research Data Services,” accessed August 18, 2015, https://wrds-web.wharton.upenn.edu/wrds/. The changes observed for larger BHCs in figure 1 imply that these BHCs may have taken advantage of the regulatory change by holding more of the assets that had lower capital requirements relative to their total capital. To get a better feel for this, figure 2 depicts the ratio of estimated highly rated tranche holdings relative to equity capital. Since the Recourse Rule would have allowed BHCs to fund their highly rated tranche holdings with relatively less capital, figure 2 also shows the extent to which BHCs could have been exposed to losses from their holdings. As in figure 1, the thin black vertical line distinguishes between the pre– and post–Recourse Rule periods; and as before, the other lines in the figure depict the averages for the four types of BHCs. For instance, a value equal to one suggests that the value of a BHC’s holdings of highly rated tranches equals the value of equity capital. GSIBs exceeded that threshold leading up to the crisis, while the securitization-active BHC groups approached that threshold leading up to the crisis. As those assets experienced losses during the crisis, the capital cushion could be wiped out. To illustrate, Isil Erel, Taylor Nadauld, and René Stulz give the example of Citigroup, which prior to the crisis had over 10 percent of its portfolio allocated to highly rated tranches, including CDOs, and only 6 percent to equity capital. If Citigroup took 60 percent losses on that part of its portfolio, doing so could effectively wipe out its capital. While that may seem extreme, a recent Federal Reserve Bank of Philadelphia study found that the CDOs at the heart of the most recent crisis on average experienced losses equal to 65 percent. Importantly, the measure of highly rated tranche holdings only includes mortgage-backed and asset-backed securities and does not include collateralized debt obligation (CDO) tranches, which suffered much larger losses than other securitized assets during the financial crisis. Even though the measure does not capture the securities that performed so poorly during the crisis, the measure would likely be highly correlated with a measure that did include these securities, were such a measure available. Note: In the BHC call report data, the variable bhck3210 measures book value of equity capital. Estimates range from 2.62 to 6.35, although I limit the range depicted in the graph to being between −0.5 and 2.0 to better visualize the BHC group averages. As BHCs’ holdings of highly rated tranches increased, so did their default risk and stock price volatility. The association between holdings of highly rated securitization tranches and increases in default risk and stock price volatility occurs only from Q1 2008 through Q1 2009 (when the sample ends), which suggests that the crisis could have come as a surprise. From Q1 2008 through Q1 2009, a 1 percentage point rise in highly rated tranches relative to total assets was associated with as much as a −1 percent change in distance to default and a 0.39 percent change in stock price volatility. The evidence likewise shows a weaker link between holdings of private-label tranches with lower ratings and changes in BHC risk. The relationship between holdings of mortgage-backed securities originated by Freddie Mac and Fannie Mae and BHC risk is negative, which could reflect the implicit understanding by investors that these securities would be backed by the government. Lastly, the results show that, on average, BHCs that relied more on short-term funding did not experience increases in default risk. For BHCs, the financial crisis was not so much a run on short-term funding, but instead reflected the rise of stock price volatility and insolvency risk resulting from shocks to asset holdings. When it comes to financial reform since the crisis, narratives often focus on the excesses on the supply side of the financial system before the crisis, but the evidence discussed here explains how the demand for securitized assets factored into the last crisis. Why might demand have been so great for the securities that spread insolvency risk throughout the financial system? Part of the responsibility could lie with the Recourse Rule, which created incentives for the largest securitizing BHCs—which were heavily involved in commenting on the regulation during the notice-and-comment process—to hold more of the very assets that wiped out bank capital. Regulations can have unintended consequences. Round One: What Role Should the Federal Reserve Play in Developing a Faster Payments System? Introduction: What Role Should the Federal Reserve Play in Developing a Faster Payments System? How Do Small-Dollar, Nonbank Loans Work?